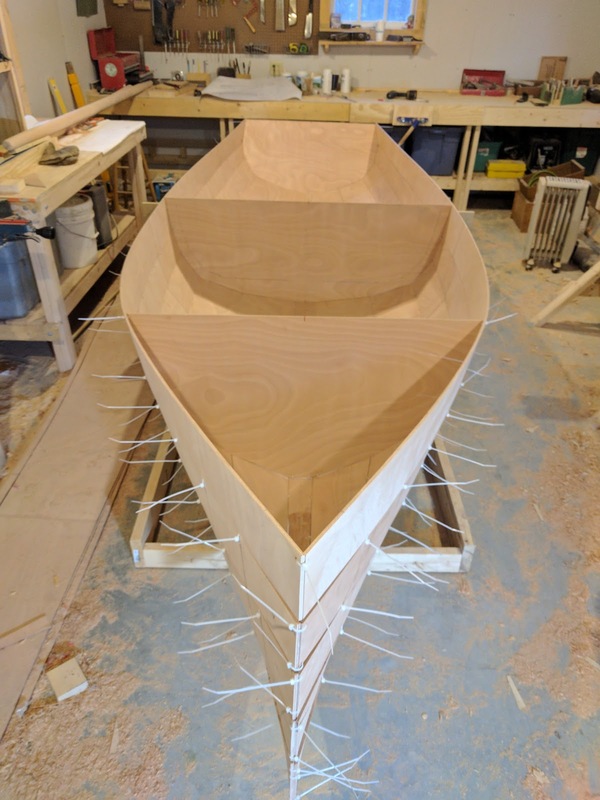 So my fingertips are really sore from drilling and pulling almost 300 zip ties to get the hull, transom, and bulkheads stitched, but it's now done. Finally... It really wasn't too bad, and the sound of the zip tie 'zipping' up and pulling the strakes tight was pretty satisfying. 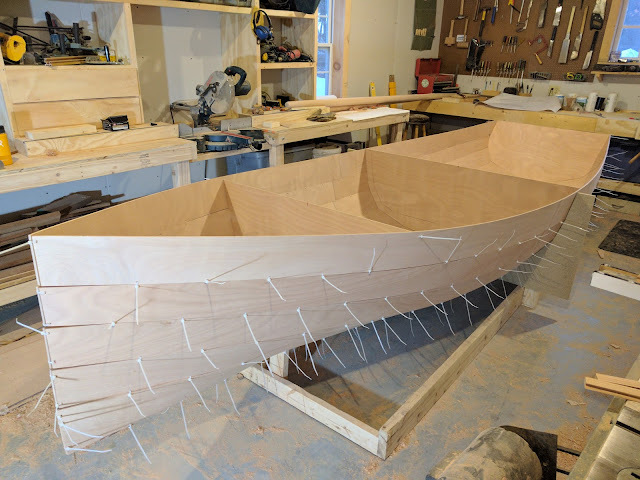 I'm happy with the results so far, all the seams are tight and the hull is nice and straight. I kept center lines and the top uncut (straight) on the bulkheads and transom so I could line everything up by sight. I emailed the designer and he suggested cutting out most of the internal bulkhead shape and just leaving tabs in place to cut once everything is glassed in. I followed his advice on frame 5 but didn't do anything with frame 10 because I'm not sure what I'm going to do with it yet. I may cut big circles out along either side of the mast, but I may do a top entry on the recessed foredeck, but I'm just not sure yet. The next step is to start tacking the hull together with epoxy to start strengthening up the shell, but I'm waiting on a tub of wood flour and several hundred yards of glass tape from Jamestown Distributors. Hopefully it should be here tomorrow and I'll get started. 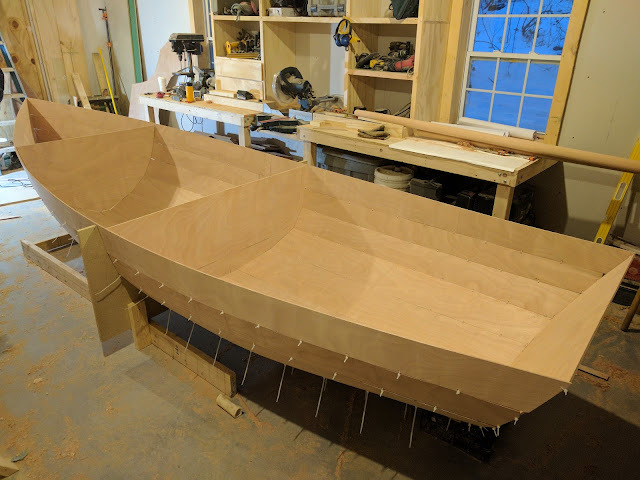 Congratulations, starting to look very boat-shaped! Question - how many sheets of ply and what type are you using? I should have listed the requirements out better in the blog, but to answer your question, it took 7 sheets of 6mm Okoume BS1088 marine ply. The first 6 sheets cover all the planks and the last takes care of the large bulkheads. I still have a fair amount of waste that I will probably be able to use for the smaller bulkheads and knees, but I may end up buying another sheet if I find I am short. Each sheet is $75USD right now at the local lumberyard.